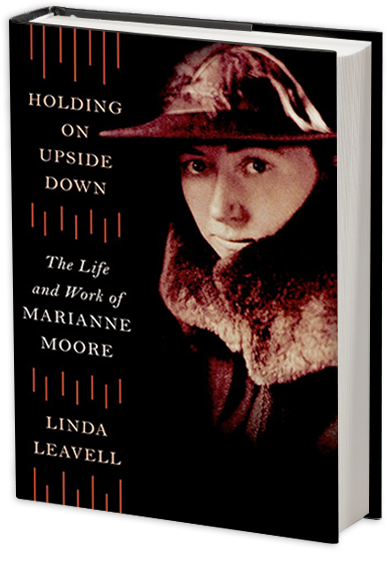 To readers who know Marianne Moore as a demure baseball fan and courtly Brooklyn eccentric, Linda Leavell’s Holding On Upside Down—the first authorized biography of this major American poet—will come as a shock. This mesmerizing, essential new book will change forever how we view the woman and her poetry. Drawing on previously untapped depths in the Moore family archives, Holding On Upside Down reveals a passionate, canny young woman caught between genuine devotion to her hovering mother, with whom she lived for sixty years, and her own irrepressible desire for freedom. The radically original verse she wrote in the early twentieth century baffled her family at the same time it both confounded and dazzled her literary peers. Her many poems about survival, it turns out, are not just quirky nature studies but acts of survival themselves. Leavell places this mother/daughter drama within a historical context of emerging modernity. Reared among single, educated women like her mother, the poet embraced feminism and progressive era ideals from early adolescence. “Everyone loved her,” recalled William Carlos Williams of the years she lived in Greenwich Village, yet no one could fathom the “mother thing,” as he called it. After her mother’s death decades later, the aging recluse transformed herself, against all expectations, into a charismatic performer and beloved celebrity who was widely hailed as America’s greatest living poet. Elegantly written, meticulously researched, and critically acute, Holding On Upside Down provides at last the biography that this major modernist and complex personality deserves.